SEO legend Aaron Wallâ€™s new SEO Toolbar could replace expensive software for many web developers. Well, not for seasoned SEO professionals, no! But for the DIY webmaster unable to afford professional SEO, or the webmaster who does employ an SEO and simply wants to proof what heâ€™s being sold, definitely. In the life of every website owner there comes a time when site optimization for the search engines, SEO competitive analysis and the use of SEO software become imperative. Without SEO many sites are condemned to â€œGoogle hellâ€� â€“ a place in the darkest corners of the Google SERPs where no search engine user can ever find them. Without SEO software the SEO competitive analysis becomes ineffective because it is time consuming and unstructured. Without a competitive analysis, SEO is just a guessing game. The basic content analysis: meta tags (title, description, keywords), site menu and text body: which keywords are targeted, and is the density of these keywords too high, etc? Links: how many and how good are the links pointing back to a site. How many reputable directory listings (usually DMOZ, Yahoo! Directory and Best of the Web) do the competitor sites have? Site pages: how many pages belonging to the same site are listed in Yahoo! and Google? Site popularity: where does the competitor site rank in Alexa and Compete.com and what is the traffic value for this site? Last but not least, because we live in the social media age, how many pages of the competitor site are indexed in the main social hubs including digg, StumbleUpon, Twitter and del.icio.us? To determine some of these factors quickly many SEOs use software like Axandraâ€™s iBusinessPromoter. The problem with such software is that, instead of offering basic SEO competitive analysis data â€œat a glanceâ€�, it generates a wordy report, which is difficult to read on your PC (too many pages). The software is also expensive â€“ not many webmasters can afford to pay, say more than 500 USD for a business edition. There are, of course, free alternatives: free online tools that analyze each of the SEO factors listed above. Their processes are however time consuming and tedious. Aaron Wall had the intelligence to pull together a series of tools that make SEO competitive analysis easier for those who need fast answers. The most recent tool is the SEO Toolbar, which is a Firefox plugin that pulls in a series of SEO and SMO data points – giving the user a holistic view of the competitive analysis data that determines the search position of a site. This toolbar is extremely easy to use. The built in SEO Xray tool allows you to perform the first SEO competitive analysis task: identify the onsite strengths of the analyzed site (meta data, page headings, internal and external links). SitePoint Xray with SEO Toolbar. Click to enlarge. The feature I like the most however is the Advanced Information Button that enables the user to export valuable data metrics including site background information, site links, page links, directory listings, traffic estimates and social media information. SitePoint Advanced Info pulled in by the SEO Toolbar. 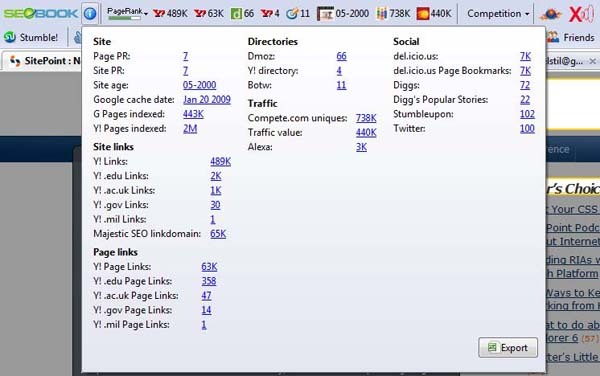 5 SEO sites compared with the SEO Toolbar. Not every webmaster or site owner has the time and/or resources for in depth SEO. Even those that do would be well advised to employ Wallâ€™s new toolbar for spot checks, SEO quality control, keyword research and of course, speed ranking checks. For in depth SEO, we cannot dismiss much needed expertise, but free tools of such quality are always a welcome addition to the SEO arsenal.